Developing a mobile application is a symbol of a business’ forward thinking. For some businesses it’s the nature of their work that requires them to have a mobile application or multiple of them. Some businesses use mobile application development to their marketing advantages and gain more exposure in the online world for mobile users. Not to mention the latest mobile friendly algorithm update from Google that would give great weight and top rankings to businesses with mobile websites and mobile applications. At WEBIZ it is our job to stay up-to-date with the latest happenings that affect our mobile app and web development methods. WEBIZ has to be your top pick among all website designing companies when it comes to mobile app development. We have the team of professionals that rejuvenates and adds to its knowledge of mobile app development every day by learning more. We have always loved to build professional looking mobile applications that are fluid and pleasing for mobile users. 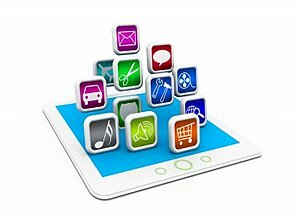 The professional coders and programmers at WEBIZ can create the most polished and professional mobile apps for your business for all major mobile platforms out there e.g. Android. iOS, Windows etc. Since we also provide top notch SEO services we can market your application in just the right way to get as much attention from mobile users as possible. WEBIZ website designing professionals have worked so far to create ecommerce, poll, event, business, educational, gaming, social, multimedia, productivity, social networking and money management applications. As a web development Company with a repertoire of all web solutions we have worked hard to gather the most professional, experienced and knowledgeable web designing specialists of the industry. These professionals work fast but don’t miss even the minor mistake that could badly impact the performance of your final product.